Looking for your new favorite ring? Well, we’ve got it right here. This is our Concise Style Ring in .925 sterling silver. It’s a plain silver band that is made up of small spheres. The high polish gives the surface an elegant and luxurious looking gleam. When you want to go sleek and minimalist, simply wear this ring alone. But if you want to go really bold, stack multiples on one finger. Another fabulous option would be to organize your own little ring party that will show off your own style and personality. 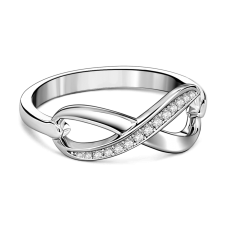 A plain silver ring like this would also make for quite the modern wedding ring or promise ring. There are so many fierce ways to accessorize with this piece.